Uglyworld #208 - Green Ice-Bat's Grand Performance, originally uploaded by www.bazpics.com. After telling the 3 wise uglies to just be themselves when they introduce themselves to the other guys, they had somewhat of a conference in the corner of the room - at the time I didn't quite know what to expect, but then Orange Ice-Bat came and asked me if he could borrow a few coins to visit the local supermarket, so of course I obliged his request. In the last couple of minutes I was summoned to the living room by Babo who said that there had been a letter left for them stating "Tonight at 8pm, the most fantastic show in the world, be there or be square!". We all gathered in the living room to find out what this could all be about, and as we sat on the couch all of a sudden all the lights went out to massive gasps from everyone as panic set in. Suddenly music started to play slowly and light started to appear from behind the living room table, everyone on the couch huddled closely together as they were both scared and excited. 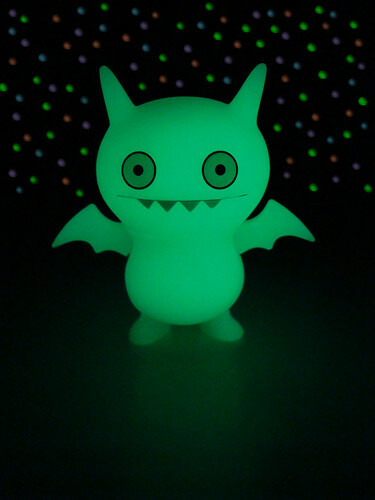 Green Icebat rose high above the table and then slowly descended until he landed on the table upon which lots of coloured lights began to flicker behind him...all the uglies were cheering, whistling and clapping...the performance was an instant hit!! !